Tucked away on the first floor of the library is the Watkinson, which holds more antique books, records, manuscripts, photographs and artworks than humanely imaginable. The new Watkinson director, Dr. Christina Bleyer, seeks to make it a commonly visited place among the Trinity community due to its novelty. Bleyer previously worked at the University of Texas as the Head of Special Collections and archives at the Benson Latin-American collection where she completed a Mellon project that rescued archives in danger in Brazil, Colombia, and Mexico by digitizing them and preserving them past their physical life. While her PhD is in philosophy, Bleyer became involved in archives during graduate school during which she started working in archives, became the Philosophy Archivist and Outreach Librarian, and eventually, the Manuscript Archivist at Southern Illinois University. Bleyer contently describes taking classes at Modern Archives Institute with the Archivist of the United States and being able to explore documentation of the entire country. During her time at the Modern Archives Institute, she learned about archives management, processing, preservation, collecting digital archives, etc., which greatly helps her run the Watkinson smoothly and without hiccups. In terms of the Watkinson’s importance, Bleyer illuminates the fact that the Watkinson holds the College’s archives, which documents the College’s history and a good amount of it, intersects with the Hartford community. The crossover between the College and its surroundings has always been an interesting topic to explore, especially considering the great disparity among the social classes and now, the Watkinson makes it easier than ever to delve deeper into the concrete, historical explanation behind this. For the future, Bleyer hopes to “make the Watkinson more accessible and more well-known” to Trinity students, faculty, and staff. There has been great progress on this since Bleyer’s time here has started; in an effort to appeal to the technology-based student body, the finding aids for the archives and manuscripts are now cross searchable on their own website (trinitywatkinson.libraryhost.com). 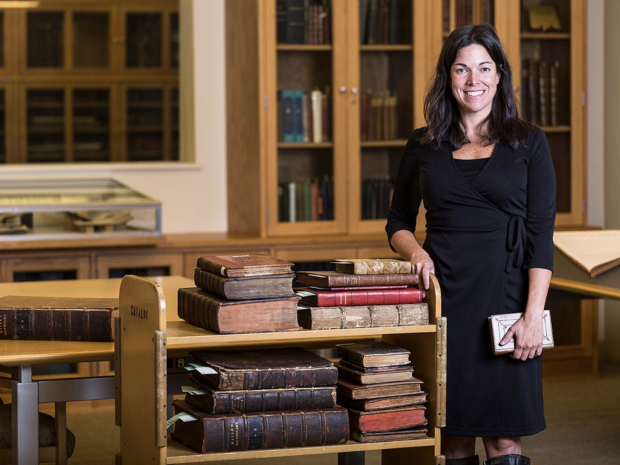 Bleyer also plans to build our Watkinson collection digitally similar to how she previously did in the post-custodial projects she completed at the University of Texas in order for “long term digital preservation” of the College’s history. In addition to all of this, Bleyer aims to create a platform to “collect oral histories from alumni and the Hartford community, namely the immigrant community” in an effort to preserve the perspectives from groups that are often forgotten about or regarded as unimportant. The surrounding community is imperative to the College’s history and without its preservation, we have a completely unreliable source of history. Bleyer invites students to simply stop by the great resources the Watkinson has to offer and explore a part of the library many do not even know about. The Watkinson is starting to offer more events to encourage the student body to check out the archive collection; in a few weeks, the Watkinson’s music library will be on display and students will have the opportunity to listen to records and digitize them on the spot. ← Bartending, Formals, and Brothers: Why Rush?